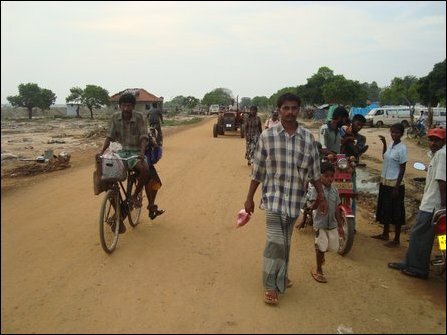 Sri Lanka Army (SLA) offensive units are continuously engaged in an offensive push, targeting Iraddai-vaaykkaal junction from Puthukkudiyiruppu (PTK) Mullaiththeevu road, amidst heavy resistance by the Liberation Tigers of Tamileelam (LTTE), according to latest reports from Vanni. Stiff fighting was heard near Iraddai-vaaykkaal junction, close to the entrance of the so-called safety zone. Sri Lanka Air Force (SLAF) bombers attacked the area at least 6 times in the morning and helicopter gunships were seen firing rockets in the evening as Multi Barrel Rocket Launcher (MBRL) shells that hit Mu'l'li-vaaykkaal rocked the safety zone. 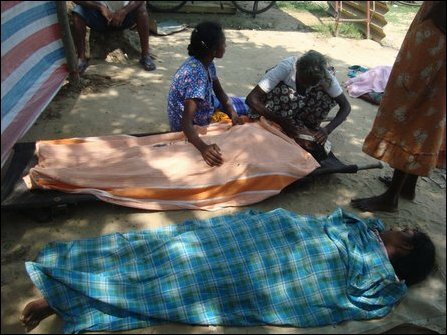 As dead civilians were buried where they were attacked, only 83 wounded civilians managed to reach the hospital at Puthumaaththa'lan upto 5:00 p.m., according to medical sources. Medical sources earlier reported that 12 wounded patients had died on their way and not brought to hospital. The hospital managed to send ambulances to Mu'l'livaaykkaal when the shelling ceased. Out of 83 admitted at the hospital, 6 died after admission, according to the medical authorities around 5:00 p.m. 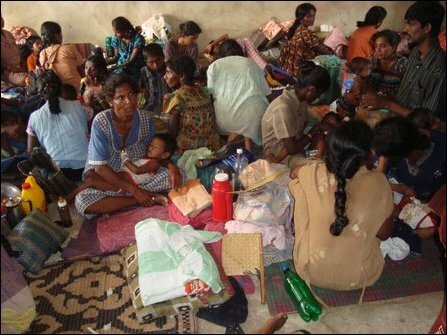 Meanwhile, a 2-year-old baby girl, Sivagnanamoorthy Prasitha, affected by diarrhoea died at the hospital Wednesday. 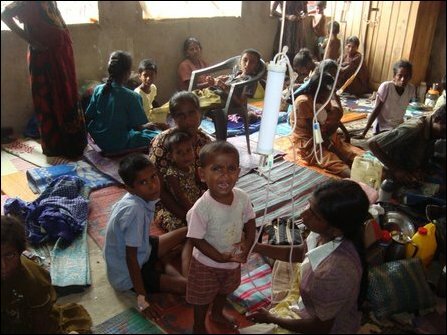 Many children have been affected by malnutrition and diarrhoea. The situation was deteriorating as humanitarian supplies were not being brought according to the requirements, medical sources said. 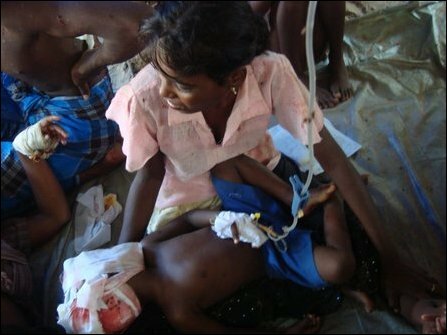 Children's ward at the hospital was full of wounded and sick. 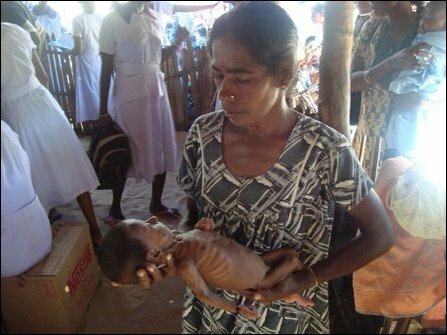 The doctors were not able to save the life of a two and a half month old baby, Sakila, admitted at the hospital after severe malnutrition. The baby died on Tuesday. Also, 4 post-operative patients died at the ward. The ICRC ship to transport the wounded is expected on Thursday. 03.07.18 Source files from one of digital cameras witnessin..
14.05.10 Lest We Forget: Children affected by Genocidal War..
16.05.09 Doctors quit safety zone, volunteer medics remain ..
16.05.09 Stench of dead bodies permeate Vanni, wounded allo..
15.05.09 More than 100,000 civilians in safe zone, ICRC sus..
15.05.09 'Safety zone' in smoke, close-quarter fighting is ..
14.05.09 LTTE urges IC to save civilians in the name of hum..
13.05.09 SLA barrage inflicts carnage, makeshift hospital r..
13.05.09 SLA shells hospital again, several killed includin..
12.05.09 US, UK want UN to facilitate 'safe evacuation' of ..
10.05.09 1200 bodies counted, hundreds seriously injured, a..
10.05.09 2,000 civilians feared slaughtered in a single nig..
09.05.09 SLA artillery barrage hits 'safety zone' as ICRC s..
09.05.09 Malnutrition in mothers triggers Jaundice, Hepatit..
05.05.09 US responsible, least humanitarian is dropping foo..
05.05.09 'Drop food now if the concern is humanitarian': Va..
02.05.09 SLA massacres patients with targeted shelling, 64 ..
01.05.09 SLA steps up attacks, civilian casualties mount am..
03.04.09 Eyewitness reports horrific experiences at makeshi..
31.03.09 SLA fires cluster shells, 45 civilians killed, 120..
31.03.09 SLA attacks kill 88 Tamils, including 21 children ..
30.03.09 SLA attacks kill 53 civilians inside 'safety zone'..
29.03.09 'Global order' experiments with body and mind of V..
28.03.09 179 civilians including 76 children killed within ..
26.03.09 SLA attacks kill Mullai DS officials engaged in hu..
26.03.09 SLA attacks hospital, 5 patients killed, 11 wounde..
26.03.09 Carnage continues, 131 civilians including 32 chil..
24.03.09 62 civilians killed, SLA, SLAF step up attacks on ..
21.03.09 SLA shelling kills 102 civilians within 3 days ins..
17.03.09 84 killed, 182 wounded in SLAF attacks, shelling o..
17.03.09 18 civilians reported missing in 'safe-zone' borde..
17.03.09 'Safe zone' under encircling fire, 137 killed in 3..
15.03.09 Civilian casualties mount as intense bombing and s..
13.03.09 SLA shelling targets relief supplies and hospital,..
13.03.09 SLA shelling targets humanitarian supplies in 'saf..
12.03.09 SLA shelling kills 82 civilians inside 'safe zone'..
11.03.09 SLA shelling kills 133 civilians including 49 chil..
10.03.09 Sri Lankan cluster shelling kills 129 civilians wi..
10.03.09 Colombo's shelling carnage of flood-hit civilians,..
09.03.09 Shelling amidst mini-cyclone and lashing rains, th..
07.03.09 Sri Lankan attacks kill 208 civilians within 72 ho..
06.03.09 Only 2.2% of humanitarian supplies reached Vanni i..
05.03.09 Perpetrating civilian starvation is violation of a..
05.03.09 SLA fires cluster shells near hospital, scores wou..
04.03.09 SLA shelling kills more children, carnage in 'safe..
04.03.09 SLA in killing spree in the 'safety zone', 73 kill..
04.03.09 Deputy ZDE of Mullaiththeevu dies of shock from sh..
03.03.09 RDHS confirms 13 hunger deaths, urges officials to..
03.03.09 SLA shells hospital environs, 13 killed including ..
02.03.09 SLA shelling kills 122 within 3 days in Mullaithth..
02.03.09 Colombo killed 700 children in 2 months - LTTE Rad..
28.02.09 Newborn babies bereft of milk, humanitarian situat..
24.02.09 Heavy fighting in PTK, civilians trapped in SLA ba..
24.02.09 Children vulnerable to SLA shelling in new 'safe z..
22.02.09 50 Tamil civilians killed, 130 wounded within 48 h..
21.02.09 13 civilians killed, 70 wounded in SLA barrage Fri..
21.02.09 SLA barrages Mullaiththeevu after Tiger air attack..
19.02.09 30 families wiped out in massive attack Wednesday,..
18.02.09 Massive air attack on civilian targets, scores kil..
18.02.09 SLA artillery fire hits new 'safety zone', 108 kil..
16.02.09 260 killed, SLA shells and boxes civilians, preven..
16.02.09 Colombo uses firebombs setting ablaze civilian tar..
13.02.09 Herding people by terror: Intense shelling, dead b..
10.02.09 Relentless shelling expels civilians from 'safety ..
08.02.09 80 killed, 200 wounded, carnage continues inside '..
08.02.09 More than 180 killed in Sri Lankan bombardment wit..
07.02.09 SLAF bombs Ponnampalam hospital, 61 patients kille..
05.02.09 SLA attacks 'safety zone' using short-range mortar..
04.02.09 Deliberate massacre, not 'crossfire' killing Tamil..
02.02.09 Nurse killed in Udaiyaarkaddu hospital, ICRC staff..
02.02.09 More than 5,000 shells fired on 'safety zone', cas..
02.02.09 SLA fires MBRL rockets on IDP camp, several feared..
01.02.09 Civilian casualties rise, SLA, SLAF attacks contin..
31.01.09 Artillery-fired cluster shells, aerial bombing on ..
31.01.09 SLA shelling continues on 'safety zone', Colombo r..
30.01.09 Only international-sponsored ceasefire can lead to..
29.01.09 Artillery barrage kills 44 civilians, 178 wounded ..
28.01.09 Brutal attack on civilians, assurance to Mukherjee..
28.01.09 46 more civilians killed Tuesday, few wounded surv..
28.01.09 Hospitals, ambulances hit by shelling, hundreds ki..
27.01.09 300,000 civilians face hunger, Colombo, abettors r..
27.01.09 Dead bodies decomposed beyond identification - med..
27.01.09 Artillery barrage continues on 'safety zone', no s..
26.01.09 Targeting civilians in safety zone, premeditated w..
26.01.09 'Biased UN official misleads humanity, safely sitt..
26.01.09 More than 1,000 wounded, Mullai RDHS urges IC to s..
26.01.09 TNA seeks IC to stop carnage, urges medical help t..
26.01.09 More than 300 civilians feared killed, people blee..
26.01.09 Does IC know no human dignity of civilians, asks a..
26.01.09 100 civilians feared killed, countless wounded, ar..
25.01.09 SLA shelling kills 22 civilians, wounds 60, target..
24.01.09 12 civilians killed, 87 wounded, SLA continues art..
23.01.09 'Safety zone' shelled again, 5 civilians killed, 8..
22.01.09 2 medical staff wounded in artillery barrage on ho..
22.01.09 Military was provided with exact coordinates of ho..
22.01.09 SLA attacks civilians in 'secure zone', several ki..
21.01.09 IC urged to act on humanitarian grounds to safegua..
18.01.09 Artillery barrage kills several civilians, dozens ..
18.01.09 Sri Lankan shelling kills 4 civilians, children am..
17.01.09 Catholic priests appeal to UN to intervene in Vann..
16.01.09 5 civilians killed, 7 injured in Sri Lankan artill..
16.01.09 Jaffna Bishop urges SL President to stop bombardme..
16.01.09 Humanitarian tragedy in Vanni enters deadlier phas..
16.01.09 "Which norms of liberal democracy preclude IC atte..
13.01.09 Doctors call for attack free zones surrounding dis..